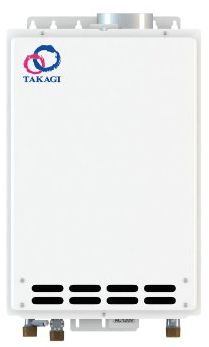 Looking for the best tankless water heater? You’ve come to the right place! Picking a new water heater involves several steps, including determining your budget, choosing the right size for your home, figuring out your cold water temperature, as well as deciding the maximum GPM you will need. This is enough to make your head spin. That’s the reason why we decided to put together this resource – a one-stop-shop, all-inclusive, comprehensive guide to help you find the best for you. Step 1 : Figure out your home’s required temperature rise. Step 3 : Calculate how much hot water (GPM) you need at any time. Tankless water heaters (also known as demand water heaters) began in europe and have made their way to the states over the last few years. Unlike the traditional ones, they are instantaneous water heaters that heat water directly without the use of a storage tank. 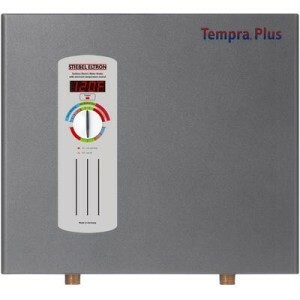 Tankless heaters operate only when there is a demand for hot water. When a tap is turned on, the cold water travels through a pipe into the unit. A device called the “heat exchanger” gets activated by the incoming water flow. This device’s main purpose is to transfer heat from one source to another. You’ll find in your air conditioner, refrigerator and car radiator. In the case of water heaters, it transfers heat generated by electric coils or a gas-fired burner to the water that comes out of your faucet. In other words, when you turn on your hot water tap, the incoming water circulates through the activated exchanger, which heats the cold water to your preset temperature. When these heaters were first introduced to the market, they had several issues such as short bursts of cold water (also known as : cold water sandwich), and other flaws. Luckily, when they have flourished in the community and became popular, almost all of their associated problems have been overcome and fixed. Nowadays, don’t let anyone tell you that water heaters are a sub par choice. Rinnai is one of the best brands on the market. They have been in business for almost a century. Rinnai was originally a company that manufactured gas appliances, home heating appliances, and boilers. They started manufacturing water heaters around 1964. Their condensing technology allows for maximum energy-efficiency. Rinnai heaters are some of the best energy-efficient products we’ve come across. These on-demand water heaters are designed to use one-third to one-half less energy than conventional tank-type (storage) ones. 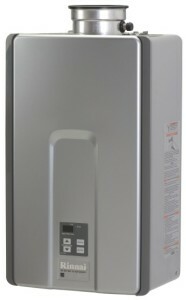 Rinnai RL94iN is one of the best natural gas tankless water heaters on the market, all things considered. And, assuming you’ve got the cash to throw around, it’s one of the highest quality gas water heater you can buy. Rinnai RL94iN has a hot water flow rate of 9.8 GPM, which is quite impressive. You’ll literally never run out of hot water. With such high flow rate, the Rinnai RL94iN can supply a whole household at anytime. That said, family members can take a shower concurrently in several bathrooms, wash a load of laundry or do the dishes without having to worry about running out of hot water. Rinnai is known for the durability of its great products. They are estimated to last up to 20 years, which is quite long compared to the conventional one. Additionally, you don’t have to worry about your water heater breaking down and having to buy a whole new system since every part of a Rinnai tankless water heaters is replaceable, and that’s what we love most about them. If I had to nitpick the Rinnai RL94iN, it would just be the price – something this good is naturally expensive. If you want to go balls-to-the-wall and actually purchase one of these units, you’ll be looking at a $800-$1400 price tag depending which model you choose. That hefty price tag can be difficult to swallow. However, we do think you get a lot of bang for your buck with this water heater. Rheem is one of the most recognized brands in the industry. They were established in 1930, and they have been making quality water heating equipment ever since. Rheem electric products are much cheaper compared to gas powered ones. However, they are fairly low GPM deliverers, therefore, they are best suited for small water needs such as a single faucet or shower. Rheem on the other hand are very powerful. Their GPM (gallon per minute) ranges between 6 and 9.5 GPM depending on which model is chosen. That’s outstanding. So, if you have a large family living in a big house, and you’re looking for the best gas heater that can fulfill your simultaneous needs for hot water, you can’t go wrong with Rheem RTG-84XLN. The RTG-84XLN comes with remote control panel that can be used to set the output water temperature and subsequently could possibly display fault codes. The RTG-84XLN’ default water temp is 110F, but up and down buttons makes bumping the temp to 120F just a few clicks away. Rheem RTG Prestige models are the most energy-efficient on the market with a 0.94 energy factor. Rheem’s condensing technology that was put into these water heaters uses the exhaust gases to reheat incoming cold water which is why they are the most efficient solution on the market. This product come at lots of different price points. The unit linked to above is a bit highly priced. However, you get a lot of bang for your buck here. 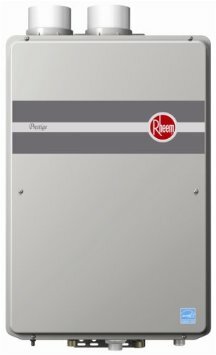 You can also find plenty of Rheem tankless products at lower price points – from $500 up into the $900 range. If I had to pick some criticisms for it, I’d have to say that you might need to upgrade your natural gas supply, as this product requires high gas flow supply. While most tank water heater only require around 40,000 BTU, this product needs 199,900 BTU of natural gas. This might seem counter intuitive; why should a super efficient appliance take more energy than a less efficient appliance? that’s because the tankless water heater must heat the incoming cold water very quickly, in just the few seconds that the water is running through the heater on its way the the hot water tap in your house. Stiebel Eltron is a german company based in Holzminden. The company was founded all the way back in 1924 by Dr. Theodor Stiebe in Berlin. Stiebel Eltron first began making instantaneous water heaters out of their factory that only had 30 employees at the time. Five years later, they substantially extended the range of appliances to include overflow heaters, pressure-type hot water appliances and storage boilers. Today, Stiebel Eltron is one of the most authoritative brands in this field. They have made a name for themselves in the industry, space heating and renewable energy. Stiebel Eltron produce some of the best electric tankless water heaters in the world. We have come across a ton of you who have used and loved Stiebel Eltron. Stiebel Eltron products are very inexpensive. That’s part of what makes them so appealing. You can get a reliable one for under $600. Stiebel Eltron Tempra 24 Plus (linked to above) is one of the best and most technologically advanced tankless water heater available on the market today. It can completely replace a conventional tank heater with no disruption to your comfort and hot water needs. Likes to brag about its exclusive trademarked Advanced Flow Control™ technology, which automatically adjusts the flow of water to eliminate unpleasant temperature fluctuation. This translates to a constant temperature output no matter how great the demand for hot water is. To put it simply, you’ll get a consistently satisfying experience every time, and all the time! While conventional tank water heaters are subject to standby losses which amount to 15 – 20% of the kWH used, a good one like the Tempra® eliminates these losses and cuts the bill by at least 15 – 20%. That’s another great thing we love about these. Additionally, the Tempra® takes up considerably less space than conventional tank type water heaters and saves valuable living space. Stiebel Eltron is regarded as one of the best international leader in the tankless electric water heating industry. The company’s German engineering and manufacturing tradition of excellence means one thing : Stiebel Eltron products are built to perform for a very long time. 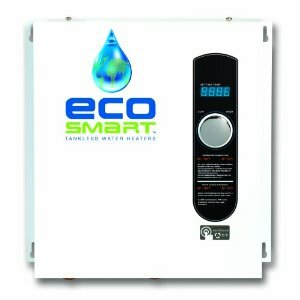 Ecosmart is one of the best tankless water heater brands out there. They’re a company known for their long tradition of making affordable products, and their water heater line is no exception. Ecosmart ECO 27 is one of the best selling on the market. And that’s no coincidence. It’s one of the most powerful heater models. It’s capable of fulfilling the needs for hot water of a relatively large family living in a medium sized home. The ECO 27 is also a good choice even if you’re living in a cold climate area like in the northern United States, where incoming water temperatures falls below 40 degrees F. At this low temperature, the ECO 27 can deliver up to 3 gallons of hot water per minute. This means it’s capable of feeding up to two showers running at the same time and running out of hot water. That’s oustanding performance. 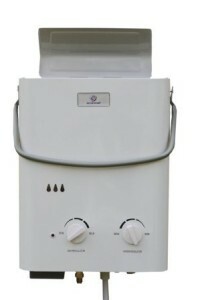 In a warm-climate area, the ECO 27 can provide up to 6 gallons of hot water per minute. This means it can run up to four showers and a sink simultaneously! If you don’t want to splurge on the most expensive product possible, the Ecosmart ECO 27 is a good choice to consider. You pick this unit for less than $500, which is very reasonable for anyone looking for a solid one that doesn’t break that bank. EcoSmart offers a wide range of energy efficient, electric tankless water heaters from point-of-use (POU) to whole home applications. We are particularly fond of the ECO line, since these products are very well-engineered. The Ecosmart ECO 27 is rated at 27KW at 240 volts. Internally, there are three separate 9KW heaters operating in sequence based on demand. The ECO 27 is truly self-modulating and will not provide more heat than the load requires. It is also equipped with a digital temperature control, that you can use to adjust water temperature to your liking. The ECO 27 comes with a lifetime warranty when professionally installed. Ecosmart completely stand behind their work and also stand behind their words regarding their lifetime warranty. The T-KJr2-IN-NG by Takagi is one of the more economically sound out of all the Takagi. While most of the gas powered tankless water heaters are priced at over $800 easily, the 34C can be purchased for around $500, respectively. It’s one of the best at this price point. However, the T-KJr2-IN-NG does not forfeit quality for price. We come across a ton of people who have used this particular water heater unit and swear by it. The T-KJr2-IN-NG has a maximum flow of 6.6 GPM with the temperature rise being set to 35°F. However, because the T-KJr2-IN-NG is a demand water heater, it balances the incoming water temperature with the outgoing. Therefore, the colder the incoming water, the higher BTUs required to get to the set delivery temperature. So, the unit will automatically lower the GPM so that the cold water can come up to the desired temperature. The T-KJr2-IN-NG comes fitted with various safety features including freeze, overheat, surge protection, and troubleshooting diagnostic codes. It also comes with a remote control for extra comfort and convenience. Additionally, it complies with Ultra-Low NOx regulations of less than 14 ng/J (<20ppm). You may be asking yourself what this brand is doing on the list. It’s clearly outclassed by most of the other top 10. So why did we list it? Price and Portability. While most products out there- whether gas or electric powered ones- we reviewed so far are priced above $600 easily. The Eccotemp L5 gets the job done for around $120. And on top of everything else, it’s portable. The Eccotemp L5 is the best selling portable water heater on the market. It’s a perfect choice for campsites, cabins or simply around the house. It’s also ideal for use in emergency situations. It has 1.4 GPM flow capacity and comes with manual water temperature adjustment from 80 – 150ºF. It also comes with hose and regulator to connect directly to the same tank that fuels your backyard barbecue grill to heat up to 1.4 gallons of water per minute almost anywhere you can access a trustworthy water source. The Eccotemp L5 Heater features a standard 1/2′ NPT pipe fitting for its inlet water supply, but comes with an adapter to use a standard garden hose. The heater is equipped with an automatic electric ignition unit powered by two D-cell batteries, which ignites the heater automatically as the water starts running through it. There is no other water heater out there that can generate 37.5K BTUs worth of hot water in such a compact, portable unit. This thing has litterally no competition. Bosch is another impressive example of genuine German engineering. They are the largest manufacturer of home appliances in Europe and one of the leading companies in the sector worldwide. They have been in business for a very long time, and they have mastered the art of providing quality products. And their electric tankless water heater line is no exception. 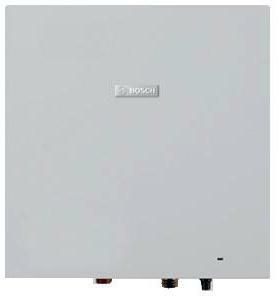 The Bosch WH27 is a compact, powerful one with 97% efficiency and very minimal standby loss. It can be installed virtually anywhere. It’s equipped with a flow sensor and a modulating control unit which eliminates unpleasant temperature fluctuation, ensuring a constant output temperature. This translates to a constant temperature output no matter how great the demand for hot water is. The prices of Bosch heaters are usually at a perfect balance. Some can cost up to 1 thousand dollars and more. You can usually find a Bosch for less than $800. This stood out to us as not being too cheap, but not expensive either. The main concern with Bosch water heaters is that they are a little bit lacking in terms of GPM (Gallon Per Minute). While most similar products we’ve come around deliver up to 9 GPM, the Bosch WH27 can only provide around 5 GPM. Noritz is another recognized tankless water heating brand. They have been an innovator in the industry for over 60 years. And they were the first to manufacture an electronically controlled tankless hot water heater in 1981. Today, Noritz is pioneering energy savings and superior hot water delivery worldwide. Noritz offers a huge selection of products to meet the varying needs of its broad spectrum of customers. 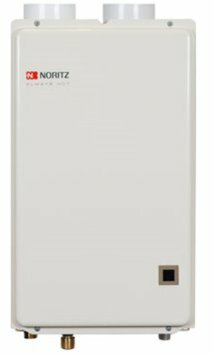 The NRC661 is one of the best gas tankless hot water heaters that Noritz has to offer. It sports a capacity range of up to 6.6 GPM. Noritz heaters come at lots of different price points. The NRC661 costs less than $1,000. Our purpose here isn’t to convince you guys to go out and splurge on the most expensive possible. Quite honestly, this unit isn’t even close to the most expensive we’ve seen. However, we do think you get a lot of bang for your buck with this gas water heater. There are a number of factors you should consider including incoming water temperature, maximum desired water flow rate, and fuel type : natural gas, propane, or electric. We are here to make this whole process as easy as possible for you. We will walk you through everything you need to know in order make an informed decision and buy the best for your needs. 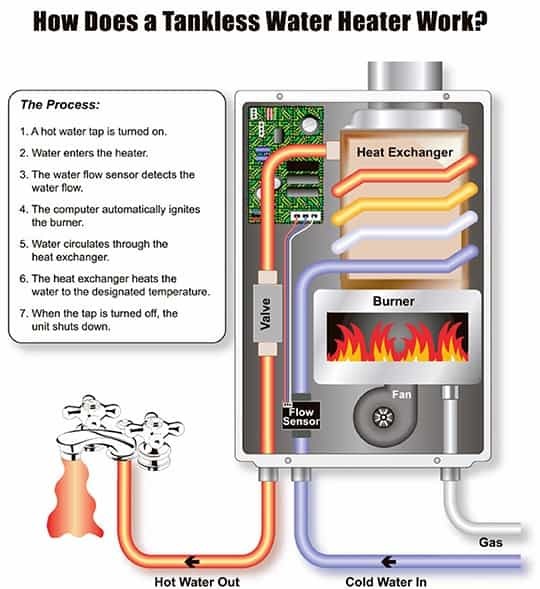 Unlike a regular water heater, a tankless model’s water output gets affected by groundwater temperatures. The same tankless water heater model that provides 8 gallons per minute (GPM) when installed in a warm-climate area (i.e Texas) will only be able to output around 4.5 GPM when installed in a cold-climate area (i.e New England). Simply because colder water requires the temperature to be raised 77 degrees rather than 44. With that said, use your coldest groundwater temperature to calculate the gallons per minute you’ll need. 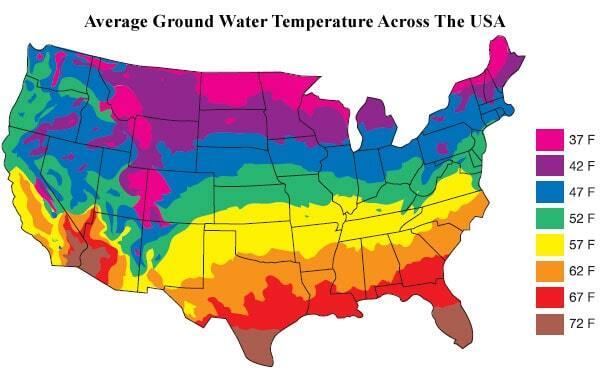 For example, if you live in California, you have a ground water temperature of 57 degrees Fahrenheit. To reach an ideal hot water temperature of 120 degrees Fahrenheit, subtract 57 from 120. You have a required temperature rise of 63 degrees Fahrenheit. Tankless water heaters are becoming an increasingly popular choice among homeowners for many reasons. For many homeowners, the lack of electrical power or the availability of natural gas or propane to their home dictates what type to go with. However, The choice many other people have to make, any time a water heater needs changed, is whether to go gas or use an electric one. We’re not going to get into the debate about which is better; – electric or gas water heater – they both clearly work, and there is no easy and simple answer to the question of which is better. Choosing the right one for your household or business depends on your individual situation, your needs and circumstances. Deciding between the two can be tricky. Storage-type water heaters are rated by tank capacity in gallons, and by recovery time, which is the time required for the tank to reach a desired temperature when filled with cold water. Tankless ones are rated differently. Instead of total gallon capacity, they are rated in gallons per minute, and by the maximum temperature rise possible at a given flow rate. In order to make sure you never run out of hot water, your tankless water heater’s maximum gallons per minute should never be exceeded. If there is certain time of the day when a huge amount of water is being used, then you’ll need to evaluate the GPM for that time of day. Add up the total amount of hot water that you may be using at at one time. For example, if you want to be able to run the shower, a dishwasher, and the clothes washer simultaneously, you would have a usage of 3.5 – 7.5 gallons per minute depending on the flow rate of your shower, dishwasher, clothes washer and fixtures. Use this chart below to calculate the gallons per minute (GPM) of hot water each of your fixtures and appliances needs and add up these amounts to get an overview of the total GPM for your household. If the idea of constantly heating your water in a big conventional tank sitting in your basement or garage sounds mighty inefficient and wasteful to you, then a tankless water heater may be the right option for you. The idea is that it heats the water as you need it instead of continually heating water stored in a tank. So, If you’re considering making the switch, you should carefully weigh the pros and cons first. To make it easier for you, we have researched some of the advantages of a tankless system, alongside some of the compromises related to the compact, more energy efficient option. There are many advantages to switching: From increased energy saving and reduced operating costs to space savings and extended lifespan, find out more about what makes for good reasons to upgrade. Comfort and convenience : There’s no two ways about it : Tankless water heater perform much better than the traditional tank heating systems. They take up much less space and provide you with an unlimited amount of hot water. When you are using one, you’ll say goodbye to compromising on hot water usage, or scheduling your family’s bathing times. Eco-friendly with on-going cost savings : One of the few downsides of making the switch, is the big money sink that goes into the water heater – if you really want to get a good one, you have to shell out some serious dough. 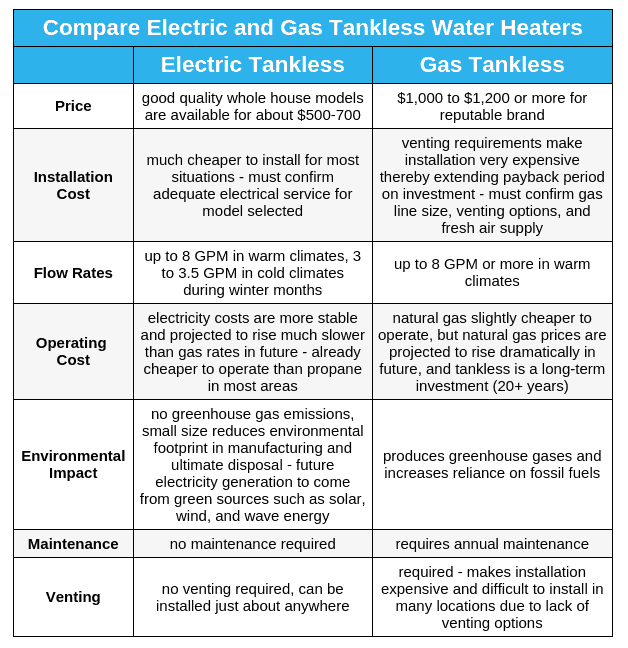 However, while tankless water heaters are a relatively pricey upfront expenditure, their operating costs down the line should start to make up for it. Unlike traditional tank heating systems, these products are cost-effective, so you’re saving in not having to spend money on standby heat, meaning you’re not wasting money heating water in a big tank that’s just sitting idly waiting for someone to need hot water. To the contrary, tankless units operate only when there is a demand for hot water, so there’s no energy wasted on heating unused water. This will reduce energy costs by as much as 35% a year. Long lifespan & Reliability : Tankless heaters last about five to 10 years longer than a tank heater. They are estimated to last up to 20 years, compared to tradional tank water heaters that are supposed to last between 10 to 15 years. With that said, if you are planning on staying in one home for many years, that’s a hefty replacement cost you’re saving. Space Savings : Even if you weren’t concerned neither about saving money nor about energy efficiency, one of the biggest, yet most important advantage of going tankless is the the potential space savings. Traditional ones are bulky. I mean think about that big tank of 40 to 60 gallon capacity measuring at the very least around 60″ tall and 24″ wide. That bulky metal tank can take up precious real estate in a home where space is at a premium. A tankless one, in comparison, might be the size of an ordinary medicine cabinet, meaning you can install it in very tight spaces such as as closet or even under a sink. Safe and Clean : Another area in which the demand water heater – score high is safety. First Of all, with tankless you avoid using water that has been stored in a tank with accumulated rust and scale. Additionally, and unlike the storage type that keep gallons and gallons of water heated twenty-four hours a day, seven days a week, water heater units safety is due to the fact that they only operate when hot water is needed. Some of the latest tankless water heaters aren’t afraid to push the enveloppe, they come with several innovative features which boost their safety. For example, some high-end models are fitted with monitoring systems that provide details about water pressure and flow. And in case of failure, the heater turn off instantly. While they might sound like a no brainer, there are several reasons why opting for them might not be for anyone. Limited Water Output : A traditional big tank water heater that stores up 60 gallons of hot water at a time will feed your showers, laundry and faucets with sufficient hot water for quite some time. Additionally, the moodern tanks reheat additional water supply quite quickly as well, so you’ll litteraly never run out of hot water when you need it. Whereas, A tankless one has very limited output and it’s only able to provide a few gallons of hot water at all times but also at a time. That said, if you are living in a big house and have large family, and everyone’s taking a shower, doing the laundry and dishes at the same time, a tankless one might not be up to the task or suitable for your family’s particular needs. Hefty Upfront Cost : One of the few downsides of making the switch is the big money sink that goes into the tankless water heater. It will cost you twice as much as conventional tank water heater. Additionally, and unlike conventional storage tanks, retrofitting a home with a tankless unit isn’t an easy task, and it can be extremely difficult and costly. So, you’ll need a skilled plumber to do the job. Bear in mind that water heaters require good venting which can be costly. Conventional Tank Almost permanently on – stores constantly heated water.